Low-carb diets restrict the amount of carbohydrates you consume each day, allowing you more as you progress through the diet. You might decide to follow this diet for weight or fat loss, or a dietitian might suggest it to you because you are diabetic or pre-diabetic. When you’re counting carbs, it’s important to be judicious about the foods you select, opting for those with the best nutritional value. Choose whole grains over refined grains most often on your low-carb diet. On a low-carb diet, you’ll eat anywhere from 20 grams of carbs a day to 130. Starting at the low end of the carb spectrum, up to about 50 grams a day, your carbohydrates will consist of non-starchy vegetables, some berries, and foods that also contain healthy fats, like avocado and seeds. In the mid- to high-range, you’ll add in more fruits and small amounts of starchy carbs like healthy grains. You’ll see the most weight loss in the 20- to 50-gram range; eating more than 50 grams of carbs a day is a good weight-maintenance technique. The Atkins diet, the oldest and best-known of the low-carb plans, stresses non-starchy vegetables as your primary carbs in the first two weeks of the diet. In Atkins, you count “net” carbs as opposed to total carbs. You calculate net carbs by subtracting the grams of fiber and grams of sugar alcohols, if any, from the total carb count of the food serving. So, for example, it you eat a serving of breakfast cereal with 18 grams of total carbs --including 3 grams of fiber and 1 gram of sugar alcohols -- your net carb total is 14 grams. Obviously, the more fiber-rich your carb choices, the better. The South Beach diet, another popular low-carb regimen, also prohibits grains during the initial two-week phase. You can add grains into the Atkins diet in Phase Three, which occurs when you are just 10 pounds from your target weight; on the South Beach diet, you can have grains sooner, in Phase 2. All grains are not equal. Whole grains contain 100 percent of the original grain seed – the bran, the endosperm and the germ. They are full of fiber –– plus vitamins, minerals and phytonutrients. The fiber in whole grains helps fill you up so you stay satiated longer, which make them a healthier choice for low-carb diet plans. In contrast, refined grains are processed to prolong shelf life and create a soft, chewy texture. The refining process strips away everything but the endosperm, a starch that is missing the fiber, vitamins and minerals found naturally in whole grains. The manufacturers then add back in B vitamins and iron by “enriching” their refined wheat products. The starches in refined grain digest quickly, turning to sugar and leaving you feeling hungry again very soon. Because of their nutrient content, whole grains are linked to a variety of health benefits. One significant review, published in Nutrition Research Reviews in 2004, concluded that consuming whole grains leads to improved cholesterol numbers, helps with weight loss, and provides significant antioxidant protection. Antioxidants are compounds found naturally in foods that fight off free radicals that can damage cells and lead to chronic disease. If the purpose of your low-carb diet is to lose inches, a study published in the Journal of Nutrition in 2012 found that consumption of whole grains helped decrease body fat in post-menopausal women better than refined grains during a three-month trial. 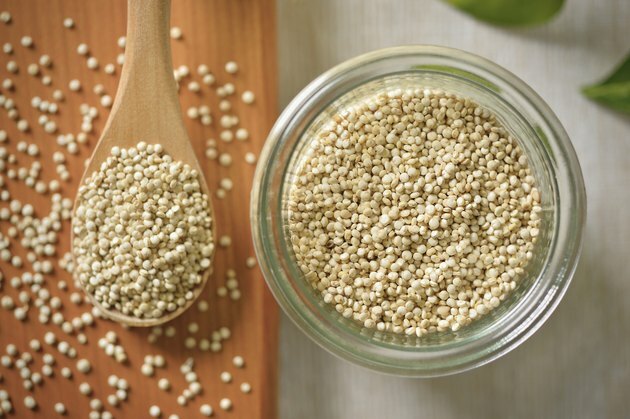 The Atkins diet suggests experimenting with these whole-grain servings in Phases Three and Four: 2 tablespoons of wheat bran, wheat germ, oat bran or polenta; 1/4 cup quinoa or steel-cut oats; 1 slice whole wheat bread; 1/3 cup regular rolled oatmeal; or 1/2 cup grits, whole wheat pasta, barley, millet or brown rice. In addition to some of the same whole grains, the South Beach recommends barley, buckwheat and farro. The South Beach program offers a collection of whole-grain recipes, including buckwheat pancakes, barley pilaf with roasted cauliflower, warm farro salad and herbed quinoa with edamame. However, if you suffer from celiac disease or are otherwise intolerant of gluten, a protein found in many grains, you will need to choose only gluten-free grains on your low-carb diet. For you, the best grains are amaranth, buckwheat, millet, quinoa, brown rice, sorghum, teff, and wild rice. You can also have oats that are clearly marked “gluten free” and have not been contaminated with gluten during growing or packaging. Do Whole Grains Cause You to Gain Weight?